The Brits call it a 'bake'. People from Minnesota often describe it as a 'hotdish'. 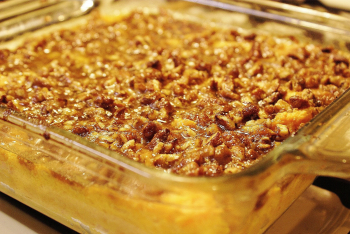 Most of us however use the term 'casserole' to denote a food baked and served in a single dish. 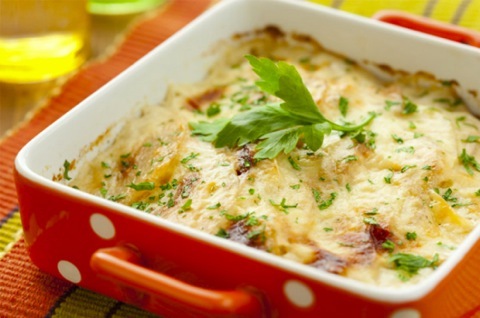 The variations in casserole dishes include ragouts, cassoulets, gratins, tagines and much more. 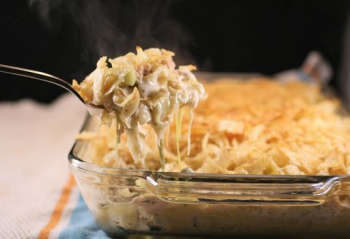 No matter which type of casserole dish you prefer, it has become a favorite way to cook and serve food since casseroles first appeared in the 19th century. This is a flexible dish. Other noodles can be substituted for the egg noodles. Yellow, green or orange peppers can be used rather than red, or use a combination of them. Don't forget the red onion. For a richer dish, regular fat milk, mayo and noodles can be used. Even a few veggies can be thrown in, such as peas. In a large bowl, combine the soup, milk, mayonnaise and mustard. Stir in the tuna, mushrooms and red pepper. Drain noodles and add to soup mixture. Stir until blended. Transfer to an 8-inch square baking dish coated with cooking spray. Combine topping ingredients. Sprinkle over casserole. Bake at 400 degrees for 25-30 minutes, or until bubbly. Serves 4. 1-1 1/2 cups - 322 calories. 4 grams fiber, 18 grams protein, 9 grams fat. 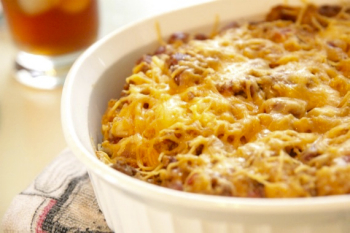 This easy and delicious casserole recipe comes from the popular blog SingForYourSupper.com, where it is called 'My Mom's Mexican Casserole'. She recommends this for a large gathering since the recipe can easily be doubled or tripled. And according to her mom, this casserole's leftovers freeze well. In a large skillet, brown the beef. Drain off fat. Stir in tomatoes, onion, taco seasoning, soup and water. Simmer over medium-low heat until everything is well mixed and heated through. Put down a layer of crushed tortilla chips, followed by a layer of the meat/bean mixture, than half of the cheddar cheese. Cover with foil and bake 20-30 minutes, or until bubbly. Let sit 5-10 minutes before serving. Top with sour cream and salsa. Place potatoes in a Dutch oven, and cover with water. Bring to a boil. Reduce heat; simmer 12 minutes, or until tender. Drain. Combine the half-and-half and the next four ingredients (half-0and-half through egg) in a large bowl. stir with a whisk. Add potatoes to egg mixture. Beat with a mixer at medium speed until smooth. Spoon potato mixture into a 13x9 inch baking pan coated with cooking spray. Combine flour and sugar in a food processor. Pulse to combine. Add chilled butter; pulse until mixture resembles coarse meal. Stir in pecans; sprinkle over potato mixture. Cover and bake at 375 degrees for 15 minutes. Uncover and bake an additional 25 minutes, or until topping is browned and potatoes are thoroughly heated. 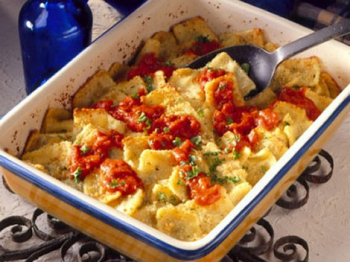 Baked ravioli is a perennial favorite. This recipe from Martha Stewart gives you the flavor of a made from scratch sauce with the ease of store-bought frozen ravioli. If you want to cut the acidity of the tomato sauce, add some sugar to taste. Heat oil in a large saucepan over medium heat. Add onion and garlic, and season with salt and pepper. Cook, stirring occasionally, until softened, about 5 minutes. Add thyme and tomatoes. Bring to a boil, reduce heat, and simmer, breaking up tomatoes with spoon until sauce is thickened and reduced to about 5 1/2 cups, 20-25 minutes. Meanwhile, cook ravioli in a large pot of boiling salted water just until they float to the top (pasta will continue to cook in oven). Drain pasta, then return to pot. 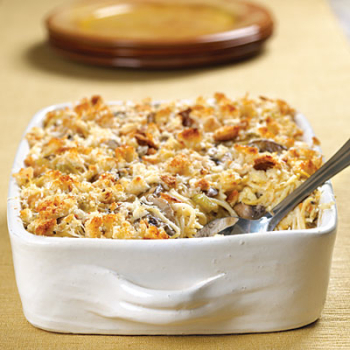 Pour pasta into a large gratin dish or 9x13 inch baking dish, and sprinkle with cheeses. Bake until golden, 20-25 minutes. Butter a 2 1/2 to 3-quart baking dish (e.g. 13x9x2 pan). Cook spaghetti or noodles acc. to package directions. Meanwhile, in skillet, melt 2 tablespoons butter over medium-low heat; saute sliced mushrooms until golden. In a saucepan, melt 1/4 cup butter; stir in flour and 1/2 teaspoon salt. Stir until smooth. Add chicken broth and cream. Cook, stirring, until sauce is thickened. Add cooked chicken, cooked mushrooms, and sherry. Heat through. Place noodles or spaghetti in a buttered baking dish. Pour on sauce. Top with Parmesan cheese and sprinkle with paprika. Bake at 425 degrees for 15-20 minutes until hot and bubbly. This recipe comes from Paula Deen via the Food Network. 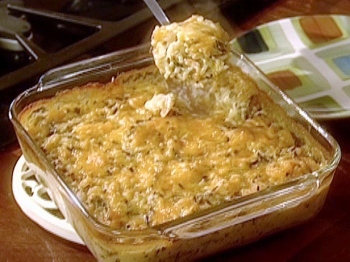 First demonstrated on her show 'Paula's Home Cooking', it was a highlight of an episode devoted to comfort food. Quick, easy and perfect as a main entree for dinner or a tasty side dish. Cook rice according to package directions minus 1/4 cup water. Bring 2 cups water and 1/2 teaspoon salt to a boil in a medium saucepan. Cook the shrimp for 1 minute. Drain immediately and set aside. Heat the butter in a saucepan and saute the pepper and onion until soft, about 5 minutes. In a large bowl, combine rice, soup, 1 1/2 cups cheese, shrimp and vegetable. Spray a 9-inch square aluminum cake pan or an 11x7 inch glass casserole dish with vegetable spray. Place mixture in the pan and top with remaining 1/2 cup of cheese.